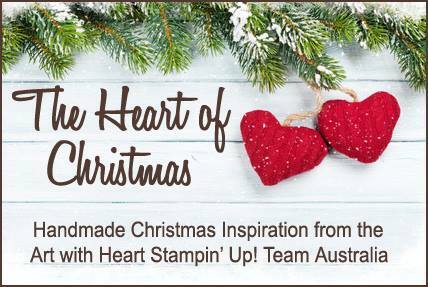 Hi everyone and welcome to week 20 of Christmas inspiration with Art with Heart Stampin'Up Team Australia. For today's card I used the Seasonal Chums Bundle. As you can see not only can you use it for tags but as a image on its own. I used the cute little deer and coloured it using water colour pencils. For the base of the card I used black card stock, for the mat I used a single piece of whisper white card stock and applied the layers which made it easier to work with. I started of with Cherry Cobbler card stock at 1 inch top & bottom, Then a 2 inch strip of paper from The year of Cheer DSP and 1 inch strip (these were just left over pieces) and I cut thin strips of Gold Foil and used Multipurpose liquid glue, Emerald Envy card stock was used for one of the circles and the 3 little christmas trees, I added some scrap cherry cobbler behind the Christmas trees to look like lights. The large circle is also from the Stitched Framelits and from Dazzling Diamond Glimmer paper. 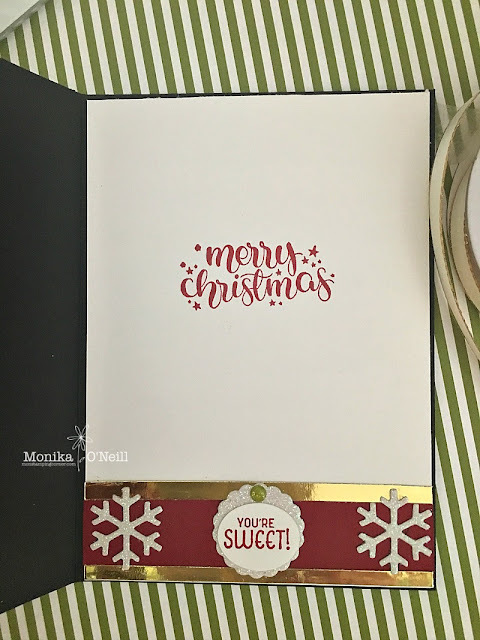 The Merry & Brights sentiment is from the Festive Phrases stamp set and embossed it in gold, I cut of lights above & below the stamp so it would fit better. The ribbon is the Gold metallic thread. To finish off the card I used Glitter Enamel dots and wink of stella. Hope you enjoyed this weeks card. To see more beautiful inspiration from our very talented ladies you can view all our participants on the lovely blog . Have a great week and will see you again next week with some more great cards.